The Wyoming Blockchain Coalition reported on Monday that the first two of the five bills proposed have unanimously passed the Wyoming House of Representatives. The two bills that passed will move on to the Senate. They include HB 19 “bitcoin bill," and HB 70 “utility token bill,” which classifies the token in different classes. The remaining three bills will be voted on soon. The passing of the utility token bill is a positive step for MetaX, and the company's CRO Alanna Gombert said these types of laws are critical for companies focused on supporting the advertising industry with blockchain. For instance, Gombert said, MetaX launched a utility coin, adToken, to power the adChain registry, a decentralized application built on Ethereum focused on voting publishers into a consensus-based quality list. The token is used for voting the publishers in or out of the registry, and advertisers will be added in soon. As the advertising industry moves to adopt blockchain, Gombert said the industry needs guidance and laws to prevent chaos. "Other bills have been proposed, but this is the most cohesive set of bills we've seen," she said. The Coalition believes the law will bring revenue and technology into the state. "In the past few weeks, we have learned that some of the most important companies in the blockchain sector are already Wyoming LLCs, and we're expecting many more to come if the bills pass," said Wyoming Blockchain Coalition co-founder Caitlin Long. "Several ICOs have already formed to target the advertising industry, aimed at creating a new model for monetizing 'eyeballs' on the Internet. We don't know if any of them will domicile in Wyoming, but they're all welcome to come here." 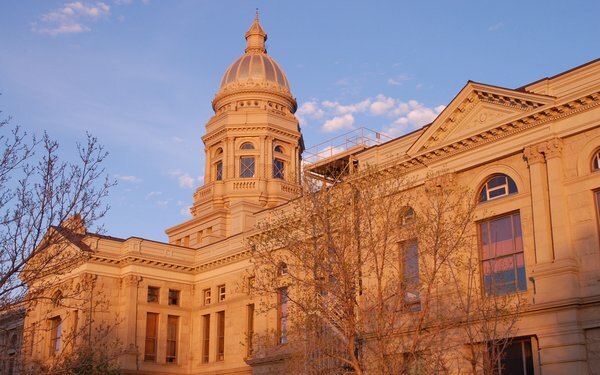 All five proposed blockchain bills have been supported nearly unanimously throughout all procedural votes to date during the legislative session, and Governor Matt Mead indicated support for the blockchain effort during his State of the State address a week ago, according to the Wyoming Blockchain Coalition. The three remaining bills include HB 101 “blockchain filings bill," HB 126 “series LLC bill,” and SF 111 "crypto property tax exemption bill." The Coalition estimates the global crypto market's worth at between $500 billion and $700 billion. While much of the industry continues to operate overseas, moves such as this by the Wyoming legislation would potentially keep business in the U.S., with a hub in Wyoming.